I participate in a group called the Yahoo! Motherboard, which is a fantastic group of mom bloggers who contribute posts to Yahoo! each month on topics relating to parenting. This month, Yahoo! asked us about whether we, as moms, impose our own childhood dreams on our kids, and how we inspire them to have their own dreams. 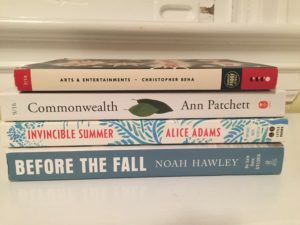 I thought I'd write about reading, and how I try to instill the same love of reading in my daughters that I had at their age, and still have today. The first step is simply to surround them with books. Those piles of books all over my house – the mishmash of review copies, used book sale finds, and library books? Well, those piles exist in the girls' room too. Some of them are books I loved as a kid, some of them are series books I've inherited from parents of older kids, and some are books that the girls have picked out from the Scholastic catalog that comes home once a month. I try not to impose my taste on them; if there's a book that catches their fancy, I try to make it available to them even it doesn't look interesting to me. (I do draw the line on books about actresses on Disney teen sitcoms!) I keep a basket of books for each girl in a prominent spot in the house so that she can read when she comes home from school, and they help pick out the books that go in the baskets. My reasoning is… they'll grow to love reading even more if they do it on their own terms. I never want reading to be a chore; I want it to be that same delicious escape for them that it is for me. I also started a Mother-Daughter book club with 9 other girls and their moms. The book club has showed the girls that reading can be social and fun – they've relayed conversations to me that they've had ﻿﻿about the monthly read on the playground with their fellow book club members – weeks before we're actually scheduled to meet. And the meetings themselves are fun, with activities and snacks to go along with the discussion. I have also learned that the books that I loved may not necessarily be the books that they will love. We read my childhood fave Eloise last month, and frankly, my daughters were bored with it. It's a bit dated, and I think they just didn't get it. Finally, I hope that the fact that I am always reading will inspire them as well. I tell them about the books I am reading and whether I like them or not, and we analyze the covers and figure out where on the bookshelves they will go once I am done. Teach by example, no? So far, it looks as though I have succeeded – both girls enjoy reading (perhaps one more than the other… for now), and actively seek out books. One has expressed an interest in reading the Harry Potter books with me (which I haven't read yet), and I look forward to seeing how they will broaden my own reading horizons in the years ahead. Tonight I had the great pleasure of hearing Jonathan Tropper read from his latest book, This Is Where I Leave You, and answer some questions. I've been a fan of Tropper's for several years – in the three years I have written this blog, he is the only author I've reviewed three times. (Here is the review of This Is Where I Leave You, here is the review of How To Talk To A Widower, and here is the review of The Book Of Joe). Tropper is as funny in person as he is in his books. Here's what he had to say. Background: This Is Where I Leave You started out as a different book. Tropper had just gotten a new publisher, one that gave him a lot of leeway, and he set out to write a book about marriage seen through the prism of divorce. He decided to have his main character lose his wife and job on the same day - two of the things that defined him as a man - and set off on a downward trajectory, flailing at age 35. Tropper then wrote a scene where his protagonist went to his parents' house for a birthday party for his father, along with his messed up siblings, and Tropper found that his book really came alive then. He ended up throwing out everything he had written so far, and made the book more about the man's relationship with his family and less about the failure of his marriage. In the interim, he had to kill off the father, turn the birthday party into a funeral, and convert the whole family to Judaism, so that he could take advantage of the seven-day mourning period. Q: Was Judd Foxman's name Judd Foxman before he became Jewish? No, he had a different name before. Tropper couldn't remember the old name. Q: Would you ever write a sequel to This Is Where I Leave You? What happens to the characters after the book ends?No, he wouldn't write a sequel. He sees no value to that. Each book is about a specific journey, and there is no use revisiting the characters when the journey is over. There is no fun going back to the same guy to see how he is now. Also, the book got good reviews – no need to bring out another version! Q: This Is Where I Leave You has been optioned for a movie. Have you thought about which actors should play the characters? No, he's bad at that. He sees his characters as he envisioned them during the year and a half he was writing the book. He doesn't see anyone particular in the roles. Q: So what DOES happen to these characters in the end? Are you worried Hollywood will slap on a happy ending? All is not healed and redeemed, they don't all love each other in the end. Deep hurts will come out again, and will fester with bitterness. Since he's the screenwriter for the movie version, he's not worried that the ending will be different. He will have to edit, get rid of certain subplots and characters to get the book to fit into a two-hour movie. Q. What's happening with the film versions of your other books? Everything Changes has been optioned, and Toby Maguire is either going to star or produce it. How To Talk To A Widower is at Paramount. The director and studio can't come to an agreement on the lead actor. Q: This Is Where I Leave You is more than just a funny book. It really struck a chord with me, emotionally – it seemed like some of the characters came right out of my family. Is it true that you are working on a remake of Harvey with Steven Spielberg? Yes. He already wrote the script for the remake of Harvey, and Spielberg got interested and asked him to rewrite it, so he is doing that. It's an adaptation of the play as a 2010 film, rather than a remake of the original movie. He wanted to tell a contemporary tale – there is not much in common with the original movie. Q: Have you heard from your former publisher since the success of This Is Where I Leave You? Yes, they have been very gracious. They know that they didn't do all they could with his last book, How To Talk To A Widower, which was a bestseller in four countries but didn't have parallel success here. He was sick of his wife calling him "Hasselhoff". Q: When you write, do you think cinematically now? No, he tries not to. He has gotten accused of doing so before, but he has always written that way, and in fact tried to make his last two books "non-optionable". (They got optioned anyway). This Is Where I Leave You is hard to adapt – much of what happens does so in Judd's head; the book is episodic; and it's not a typical three-part story. Yet it got optioned anyway. Q: Which writers influenced you, and which contemporary writers do you enjoy? When he was young, Tropper read a lot of Stephen King books, and wrote stories about vampires. Then he read Jay McInerney's Bright Lights, Big City, and it was like a bunch of light bulbs went off. He realized what you can do with writing. He commends that book, which is brilliant and economical – calls it one of the most brilliant books of the last 20 years. Kurt Vonnegut was also an inspiration. He used mini chapters and paragraphs and colloquial tone, and Tropper thought, "I could do that." (Which of course was wrong.) You don't have to be Charles Dickens or Henry James to write books. Favorite contemporary authors: Richard Russo, Jonathan Lethem, Michael Chabon, Joyce Carol Oates, and ____ Hedges (I didn't catch the name – Jonathan Tropper, if you're reading this, can you leave a comment with the name of this author??). People assume he's well-read – he isn't. He doesn't read when he's writing, and then he doesn't have time to read when he's touring, and then he's writing again, so the books pile up on his nighttable. Q: Your books are incredibly well-paced. How do you achieve that? He doesn't chart out the plot beforehand. It comes naturally, and then he edits and moves pieces around and changes things when he feels as though the plot has come to a standstill. I really, really enjoyed Tropper's talk tonight. He's very funny and down-to earth, and I also liked talking to him after the reading, when he patiently signed my four books. Thanks for a great reading! Last night, I went to a book reading at Politics and Prose by a local author named Rebecca Flowers, who read from her new novel, Nice To Come Home To. The novel is about Prudence, a woman in her 30s living in DC, who loses her job and her boyfriend at the same time. With the support of her gay best friend, her irresponsible sister, and others in her life, Prudence comes to terms with changed expectations and a new definition of family. Nice To Come Home To may sound like classic chick-lit; in fact, Flowers cites Jennifer Weiner and Helen Fielding as authors she turned to to remind herself of what it felt like to be unrooted and single in one’s 30s. But the portion that Flowers read last night, as well as her own engaging personality, suggest that this book is more than just another light read about the single woman’s quest for a man. Flowers was great fun to listen to – genuine, funny, honest, and smart – and the portion of the book she shared, which takes place just after Prudence was dumped by the man she thought she was settling for, was both funny and touching. I thought I’d share some of Flowers’ answers to questions posed by people at the reading last night. Was the book based on Sense and Sensibility? Yes, she based Nice To Come Home To on one of her favorite, best-known novels. Someone once told her that as a first-time novelist, she shouldn’t try to re-invent the wheel, but should base her first book on a book she already knows. How did she think of her characters? Flowers said that she is part of every character she writes, that her characters are combinations of people she knows. She said that it is a gift to have people in one’s life to observe, to write about. How did she get through the difficult period of writing? She “threw money at it”. She got an au pair, so that she could find time to write despite having two small daughters. She said it was helpful to tell people that she was writing a book, so that everyone in her life knew about it. Also, she did two things to keep her going: she copied an “about the author” blurb from the back of a Nick Hornby book but substituted her name instead of his; and she taped next to her monitor a doctored NYT bestseller list with her name at the top. Prudence is at times prickly and difficult. How did people respond to that? Flowers was surprised by how strongly people reacted to Prudence, including book editors and “smart women” who read the book and found the character to be too harsh. They were resistant to a character who might manipulate a man to get what she wants. Flowers felt very strongly about Prudence and refused to change her personality or water her down. Any difficulty with the editors? Flowers didn’t choose the title or the cover but she is happy with them. She figures it’s her job to write the book (which is why she fought to keep Prudence as she was written) but the publisher’s job to market and sell it. Thank you to Rebecca Flowers for sharing your book and your writing process!